An Album plagued with faster heavy grooves, but... will prevail? 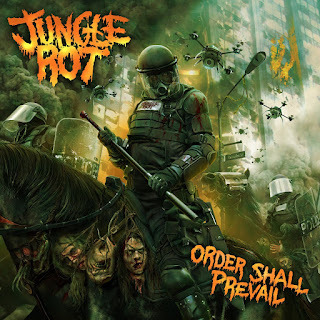 Jungle Rot is a very consistent Death metal band they have managed to remains active for over two decades, with seven previous full lengths, this year they come with their eighth album titled "Order Shall Prevail" which is the third one, under Victory Records, this album comes to complete the trilogy which began couple years ago with "Kill on Command" and the follow up "Terror Regime", personally I like how they redirect their sound and honestly if you try to compare to bands like Obituary, Suffocation or even Bolt Thrower you can hear the difference, now is a fact that Jungle Rot has adopted their own personality with thrashy riff, groovy chords and crushing drums were thrown in the making of this album. The current line-up is founder Dave Matrise performing guitars and vocals, James Genenz playing the bass, Geoff Bub as the lead guitarist and the newest member is Joey Muha behind the drum set, the album was recorded, engineered, and mixed at The Belle City Sound Company by Chris Djuricic. 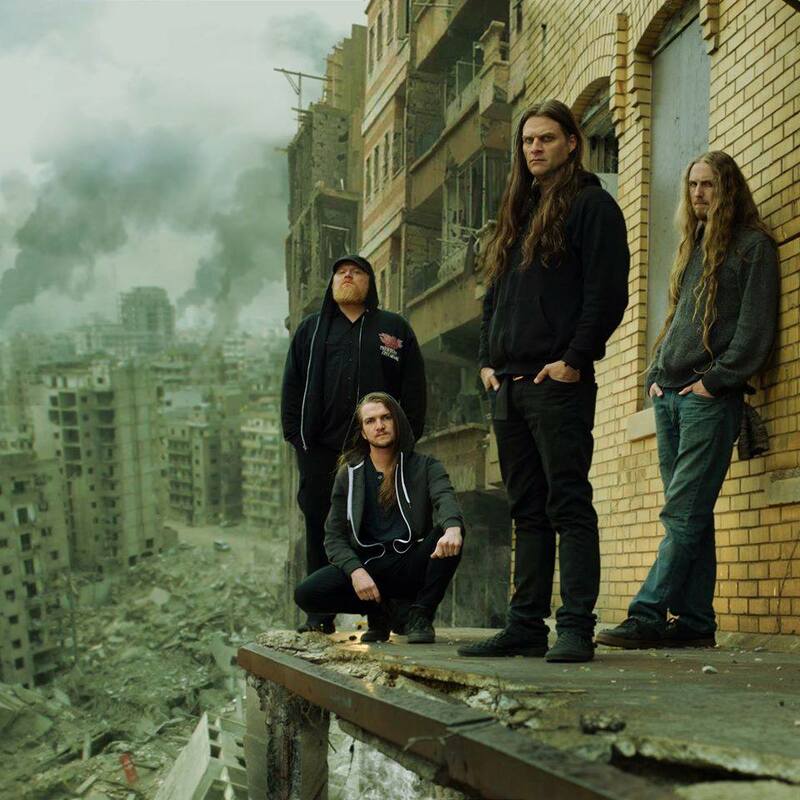 As I mentioned before "Order Shall Prevail" it ties itself to the two previous recordings, in some way I could say that they were preparing us for this recording which is faster, ponderous and furious, the opener track "Doomsday" has fast guitars they threw some trashy riff to blend along with Matrise howl's, crushing double bass drums, very intense to the end, "Paralyzed Pray" was the first single released for the band, plagued with heavy grooves, dense bass and blunt drums back up what I mean, sounds brutal but with cadence, exceptional guitar solo as dictated by masters, this is the time when you realize that a dedicated old school death metal band has transcended with their sound and then comes the grooviest song of the album, "Fight Where You Stand" featuring Max Cavalera (Cavalera Conspiracy, Soulfly) which is very exciting listening to Cavalera and Matrices together, the self-titled "Order Shall Prevail" stands out for its aggressivity, heavy riffage a solid track, "The Dread Pestilence" is slower and thicker than the previous track is like adding a good sauce on top of the steak, "I Cast the First Stone" and "E.F.K." both are little bit more oriented to the groove side of the band, nothing to complaint but here is where the magic get lost for couple minutes, then "Trench Tactics" recover the pace it sounds intense and aggressive thanks to the double bass drum with a slower mid section only to charge back at you with full hostility, the closing track is "Nuclear Superiority", it decimates the album when reaches the Floridian death metal sound, nothing wrong with that, in fact is one of my favorites death metal scene, but it kill the ambient that was built during the first half of the album. Overall "Order Shall Prevail" I could say we have a Jungle Rot who plays death metal at its best, they remain true to its roots, a band that sounds more aggressive than its previous recordings, no doubt that the new drummer Joey added his skills, the double bass drum is simply brilliant, here and there are some good riff and songs to remember, but there are few spaces that break the balance, however their effort is not enough to appeal to be one of the greatest this year.